ORANGE SINK: Spring Cabin Fever! I think everyone is in the mood for some Spring house cleaning. After all the calendar says it's that time of year! Every Spring I get the itch to purge, change, paint, rearrange in so many areas of life! I'm sure our pioneer sisters felt the same way.. isn't that why they coined the term "cabin fever"? I guess I decided I could part with this rug to start with.... sigh.... really don't want to, it's such a cute rug and nice design by Robin of Bird in the Hand Primitives. I listed it on Ebay here. Maybe it won't sell for the price I'm asking.... in that case it can live here and I won't have to go through withdrawal! LOL! After a week of doing pretty much nothing but resting and drinking a ton of Alka-Seltzer plus ( yep... a head cold tried to get the better of me!) I had to do something creative. I found an old piece of plaid wool that was a lining to a winter coat in it's former life and quick sewed together a wacky little rabbit! Stuffed him with wool and rags. He likes the little wool carrots applique'd onto his springy yellow wool scarf! He promised not to eat them until after the photo shoot! LOL! Thank-you for all your kindness and comments in the last post! Liking or hating the color purple is a very interesting topic! I sometimes am drawn to it in a big way.... like in this rug I found on Pinterest. No website or name to trace the maker. If it is yours or you know who hooked it please let me know and I'll add that information. Well, back to the dye pots. I'm selling wool here as fast as it comes out of the dryer! I think I caught your cold!!! Mine is in my chest though. Hope you feel better soon. Love that rug - now I don't know why it won't sell. Isn't it nice when there is a 'win/win' situation? What a sweet bunny! You are so darned creative. 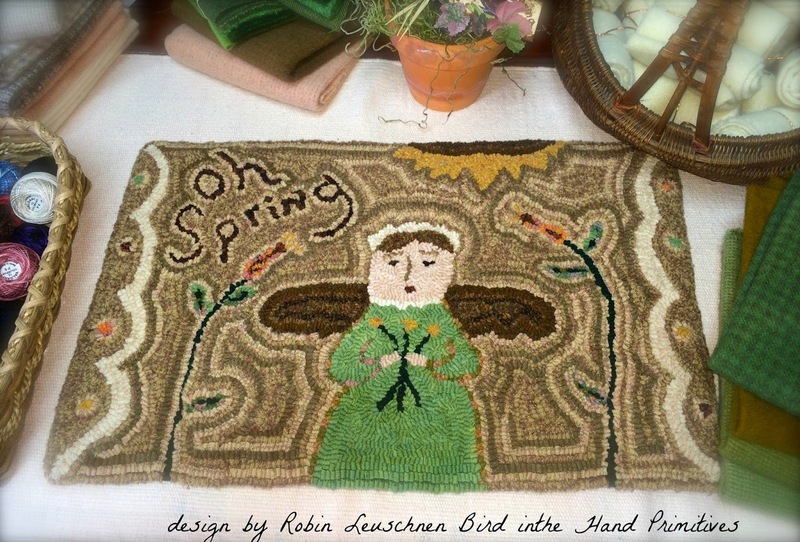 Love the little Spring mat, I'm sure it will sell quickly. Lovely bunny and I love the carrot scarf. 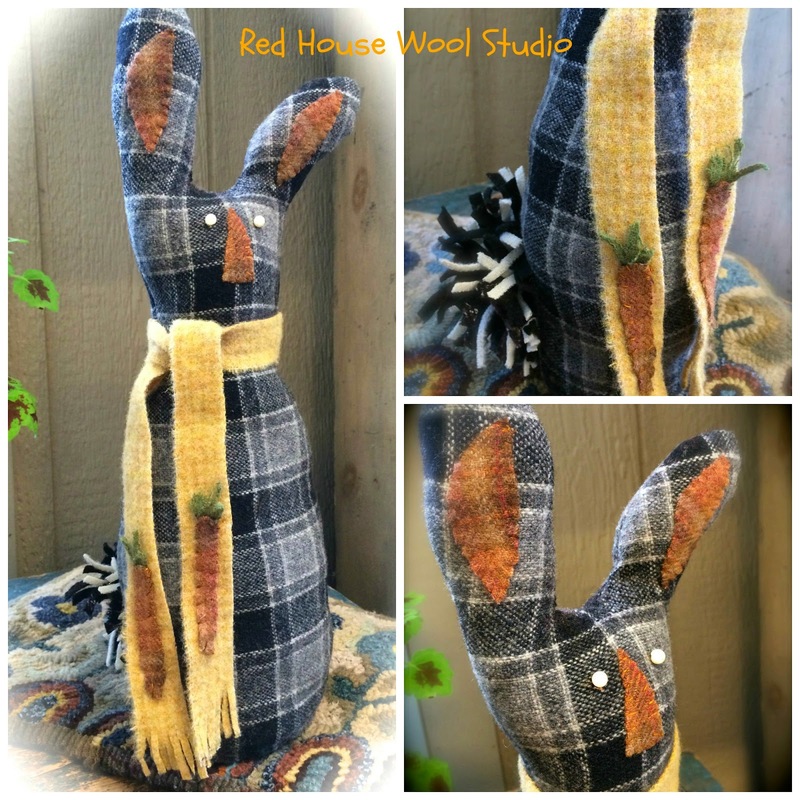 Love your Bunny , his scarf is so cute ! Feel better soon , so when it is finally Spring you can play outside in the gardens !!! Glad you're feeling better. I think I'm catching it now. Hi Cathy, You are such a kind and talented lady. Thank you for sharing my pics and story. I am proud and happy to call you my friend. I am sad that I can not come to the next hook in. But will be with my husband on his business trip in Houston. So I will miss you all and will go out looking for wool and antiques. Take care and God bless !!! Welcome My Newest Class of Rug Hookers!